The Royal New South Wales Lancers were formed as the New South Wales Cavalry Reserves in 1885, designated the New South Wales Lancers in 1894, and created Royal in 1935, the Regiment sent a squadron to fight as mounted lancers in the South African War, takes the traditions of the 1st Light Horse formed from its peacetime members to fight in the First World War at Gallipoli and Palestine, and fought as a Tank Regiment in World War II in New Guinea and Borneo. The Regiment with 21 Honours is Australia's most decorated unit, it is currently an Light Cavalry Regiment in the Australian Army Reserve. 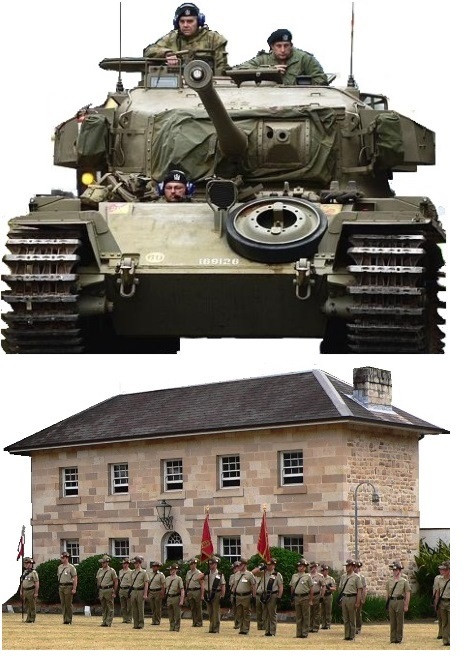 Lancer Barracks were built in Parramatta, now a suburb of Sydney between 1818 and 1820 to house the British troops who garrisoned the then colony of New South Wales. The Governor, Lachlan Macquarie recognised he was building the infrastructure for a future nation and had them built to last, eventually they were occupied by the New South Wales Lancers, becoming an integral part of Australia's Military history, and the history of the Parramatta Community. This website was established by those former Lancers who operate the Museum within Lancer Barracks dedicated to preserving the heritage of the Regiment and the Barracks. All of the material is copyright, if it is used in any publication, please obtain permission from the webmaster and credit the source. A recent study of collection's significance (by Tierney and Mason) emphasises its substantial place in our nation's heritage. CLICK HERE to view the report (7 mb .pdf file). This report covers the scope of the collection identifying it as a major Boer War research tool, including original poems by AB (Banjo) Patterson. This site uses pdf files, a reader can be downloaded from www.adobe.com. Lancer Barracks and Museum are open for inspection next sunday, Sunday 28 April 2019 10:00 - 16:00 hrs. We are open almost every Sunday. Tour groups of 5+ (with fewer, premium pricing applies) catered for on any day with a prior booking (please allow a week to process).